An Erie passenger train passes from east to west over the newly constructed iron trestle at Portage, probably in the late summer or fall of 1875. 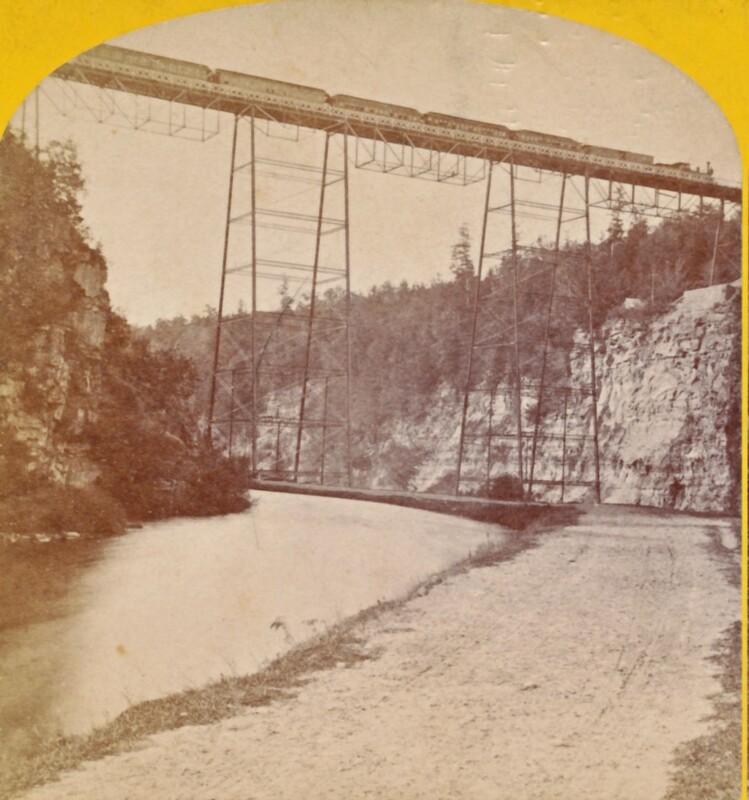 Walker had published a similar stereoview a few years earlier when the mighty Portage Wooden Bridge carried the railroad across the Portage gorge (see photo 14.) That original bridge burned in 1875, leading to the construction of the Iron Bridge, sometimes called the "spider bridge." The water seen in the photograph is the Genesee Valley Canal which continued to operate through 1878. The Genesee River and the Upper Falls would be to the right, but is not visible in this view. To take the image, Walker stood on the canal towpath, along modern day Trail #7 on the east side of Letchworth Park. A enlargement of the image is found below. You will find other views of both the Iron and Wooden Portage High Bridge by going to the index page of our Historical Photo Album. For more information on this remarkable bridge, see the Glimpse of the Portage High Bridge.